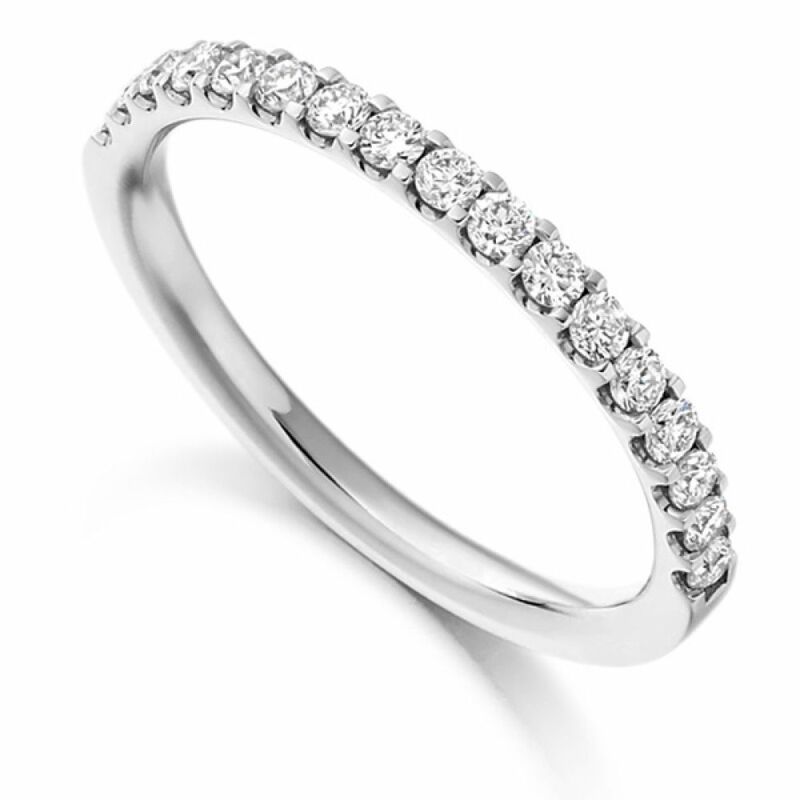 Claw set half diamond eternity ring, with 0.33cts of round brilliant cut diamonds above a court profile band. This half set Diamond Eternity Ring is both delicate and beautiful. With a total Diamond weight of 0.33cts, each Round Brilliant cut Diamond has been expertly graded F Colour and VS1 Clarity prior to being set into the design. The claw settings provides excellent security for your Diamonds, holding them in place while creating a slight contrast with their angular shape. The band itself measures a dainty 2mm in width, allowing it to sit gracefully with any straight edged Wedding Band or Engagement Ring. We can craft your ring for you in a number of precious metals, including 18ct White Gold, 18ct Yellow Gold, 18ct Rose Gold, Palladium and Platinum. Please allow us approximately 3-4 weeks to craft your ring in your desired precious metal. Your ring will then be delivered straight to your door by a secure courier, presented beautifully in our own Serendipity Diamonds packaging. Service rating : Helpful advice and clear explanation of timescale and delivery time. Product: My ring is beautiful. It's exactly how I hoped and imagined it would look. It fits well and the workmanship and presentation is first class.